Cincinnati Children’s Hospital Medical Center and the Cincinnati Bengals are working together to reverse obesity. Participating programs will take part in fun fitness events throughout the season. The first event will be held on Tuesday, September 25th from 11:45-1pm for a pre-selected group of students from South Avondale Elementary School . 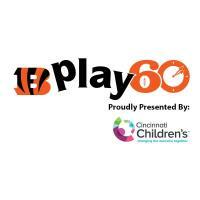 Volunteers from Cincinnati Children’s will take students through a Mini-ReCharge obstacle course at Paul Brown Stadium featuring Bengals Players, Ben-Gals and mascot Who Dey. The event is designed to reverse the increasing trend of obesity in Cincinnati and help make Cincinnati’s kids the healthiest in the nation. Roughly two in five children in Cincinnati are considered obese or overweight. Getting children to participate in physical activity, while having a great time, is the first step toward fostering a lifelong commitment to fitness.